Louise McCullough & Peter King are father and daughter and have been around dogs their whole lives. The family has always had dogs, and when they moved to the US in 1991, one of the first things the family did was get a dog. After finding local day care and boarding facilities to be unsatisfactory for Louise’s dog, Maebh, Louise & Peter decided to design and build the ultimate pet boarding experience. They knew it had to be a facility that dog owners felt comfortable leaving their dog for a day, a few nights or even weeks. Louise and Peter wanted to make sure their client’s felt that their dogs would be safe, secure, happy, and well taken care of. It also had to be a facility that could cater to the different needs of dogs. After extensive research, Louise and Peter worked closely with designers and contractors to ensure that Paws Chateau™ was built with the primary focus on the needs of the dogs. No two dogs are alike, and Paws provides a facility that takes that into consideration, catering to the needs of each dog. 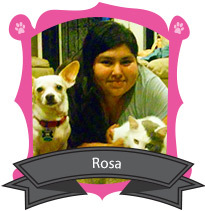 Louise is a Certified Dog Trainer through the nationally recognized Animal Behavior College (ABCDT). 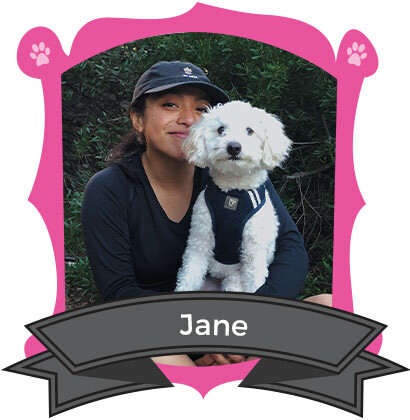 She has been training dogs for many years and volunteers with local rescues training and rehabilitating dogs to find their forever homes. She brings 20 years of Corporate Business Experience from the IT Industry to Paws Chateau. Approximately six years ago she needed to board her dog, Maebh, as she traveled a lot for work. 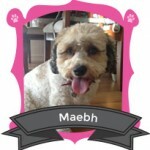 After visiting all the available facilities, she didn’t feel comfortable leaving Maebh at any of them. She started researching the dog boarding industry. She went to educational seminars, conferences, seminars and trainings and decided to build a state of the art facility with all the features and amenities that she would want for Maebh. Peter has been an Entrepreneur most of his life. He started and built successful businesses in Ireland. 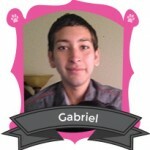 Since coming to the US he has successfully worked in sales, customer service and management. He loves the challenge of a startup business and enjoys the ups and downs that come along with it. When Louise told him about the idea she had for a Hotel and Resort for dogs he knew immediately that he wanted to be a part of it. The experience he has in building businesses from the ground up plus the added bonus of working with dogs was an opportunity he couldn’t pass up. 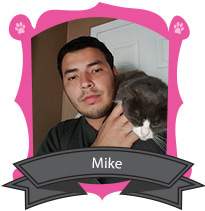 Click on any image to read more about our Paws team members. My name is Maebh and I am Director of Activities at Paws Chateau. My position is one of the most important here at Paws Chateau because I am responsible for the dogs having fun in Day Camp. I have met every dog that has come to Paws Chateau. Once I give a new dog the Paw of Approval, they get to meet the other campers and then join the play group. Since I am here every day I have gotten to know all the dogs really well, and they come to me when they get in trouble or are having a bad day. I am lucky since I have a job I love and enjoy coming to work every day. 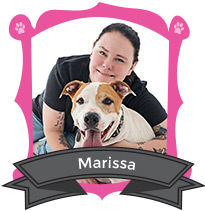 Hi, my name is Marissa and I have been working at Paws Chateau since September 2014 and I am a Shift Leader. I’m currently enrolled in Animal Behavior College where I am studying to become a Certified Dog Trainer by the end of this year. I hope to learn as much as I can from Louise and one day open my own dog hotel. Before working at Paws Chateau I volunteered at OC animal shelter where I fell in love with putting time and energy into being with dogs. I have always loved animals and have owned quite a few of them throughout my life , but have always had a special connection with dogs. Working at Paws Chateau has taught me so many things but most of importantly it’s shown me how to be responsible. My family currently has four dogs and they are all rescues, three of them are chihuahuas and my dog who is the biggest one is a mix named Kiko. I enjoy taking Kiko on hikes with his two husky best friends, he loves exploring along side his “pack.” I look forward to meeting your furry family member and watching them open up and make tons of new friends! 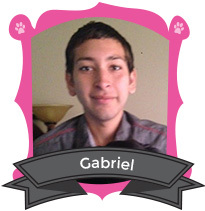 Hello, my name is Gabriel and I have been with Paws Chateau since August 2015. 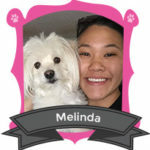 I am a Day Camp Counselor and am responsible for taking care of the dogs and keeping them safe. I am currently a student at Santa Ana College where I am pursuing history and education with the intention of becoming a teacher. I have volunteered for the Pooch Match dog rescue group for 12 years and have experience working with all types of dogs. It is a very exciting experience working with dogs because it is just like working with your best friends. The care I get to provide the animals is a very rewarding experience I get to take home with a smile every day. 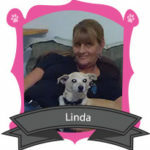 Outside of Paws Chateau I have one small black terrier mix foster dog I have provided care for the last 2 years. Hi, my name is Nakel I have been a Day Camp Counselor at Paws Chateau since December 2015 and recently became a Shift Leader. Currently I am enrolled at Orange Coast College where I am majoring in biology to become a veterinarian. I am also interested in doing genetic engineering. I have had many different pets including dogs, cats, geckos, ducks, rats and crows. I love animals and I have wanted to be a vet since I was two. I hope to someday work out in the field with wild life. I enjoy being and working with dogs because they are very intelligent animals and they know how to be a loving and loyal friend. The dog I had was named Bellaluna, she was a golden retriever, border collie, flat coat retriever, and Australian shepard mixed with many other herding and sport dog types. Hi, my name is Tanya and I have been a Day Camp Counselor at Paws Chateau since January 2016 and I love my job. I was recently promoted to Shift Lead. I currently have one dog a miniature schnauzer named Alfred. Spending time with dogs all day is the best plus Alfred gets to join the fun as well. I’ve always had a thing for animals and dogs always seem to make me happy. I’m not sure what career to pursue but definitely something geared towards animals. 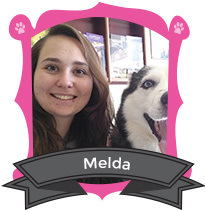 Hello my name is Melda. 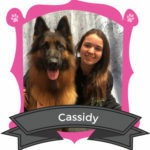 I have been a Day Camp Counselor at Paws Chateau since February 2016 and most recently a Shift Leader. Currently I am taking my general ED classes at GWC to transfer to Vet Tech school and eventually become a vet tech and a dog trainer. Dogs have always been apart my life which is why I am able to connect and talk to dogs better than humans. I hope that by becoming a vet tech and dog trainer, I can help dogs or any animal where ever I am in a medical or physical way. One day I dream of living in the country and helping my farm friends. Hi, my name is Melinda. 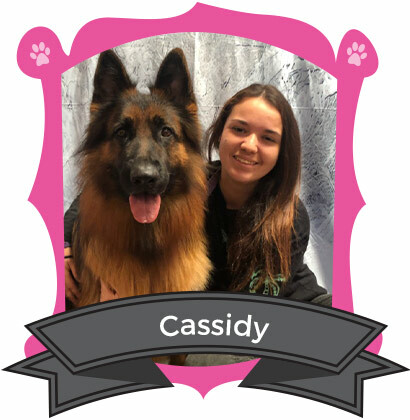 I have been a Day Camp Counselor at Paws Chateau since April 2016 and currently a Shift Leader. Currently, I am enrolled at Golden West College where I am still exploring what I really want to pursue. I have grown up with pets my entire life, and I own two dogs: Benny (Chihuahua mix) and Cody (Maltese). My mom got Benny 6 years ago from a temple when a lady set a box down full of puppies. A year later, she got Benny a friend/ sibling from a family friend that was looking for someone to care for Cody. Now, they are inseparable and double the trouble! 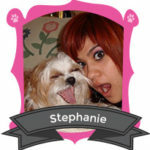 I’ve always wanted to work with animals, so it is a pleasure to be a Dog Counselor here at Paws Chateau. I have volunteered at an Agriculture department at my old high school working around with livestock animals and that was an interesting experience. I love the company of dogs because they make you learn how to be responsible, how to love and care, and they are your best friends! It is always exciting to come to work to meet and play with the variety of dogs. 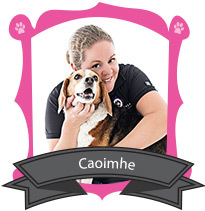 Hi, my name is Caoimhe and I have been the Events Coordinator at Paws Chateau since October 2016. I am also Louise’s sister. I have a Master’s Degree in Special Education and have worked in the field of Autism and other Developmental Delays as a Behaviorist for over 10 years. When I became a mom 6 years ago I was lucky enough to be able to be a stay at home mom. We recently got a Mini Goldendoodle called Cuddles and she is 5 months old. We had a Beagle for 10+ years prior to Cuddles that crossed the Rainbow Bridge unexpectedly. I enjoying working at Paws Chateau, hanging with all the dogs and meeting them when they arrive. 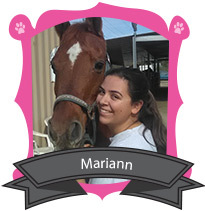 Hi there my name is Stephanie and I started at Paws in October 2016. I’m a Day Camp Counselor and recently promoted to a Shift Leader. I’m responsible for taking care of the dogs and keeping them safe. Since I was a kid I’ve always had a big heart for helping hurt animals and lost dogs and I still do. I grew up dog sitting for my neighbors back on the East Coast. 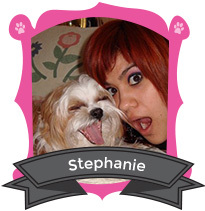 I have a dog named Oliver he’s a Shih Tzu who I love very much! I’m hoping this experience will expand my knowledge and my skills to develop into a career. I am planning on getting Certified in Animal Caretaking that will allow me to have a career with animals. 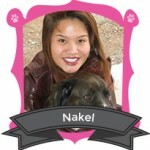 Besides being an animal lover I love nature/outdoor activities, singing, and volunteer work. I look forward on meeting your fur friends. Hi my name is Rosa. I have been a Day Camp Counselor at Paws Chateau since April 2017. I am enrolled at Goldenwest College where I plan on getting my GED. I love animals I have two dogs, a cat, turtle, bird, and fish that are family pets. I have always wanted to work with animals since I was a kid and getting into programs like FFA where I was able to work with livestock through out my four years of high school. I hope someday I will becoming a vetanerian working with all type of animals and learning new things about. I enjoy being and working with dogs because they are very intelligent. 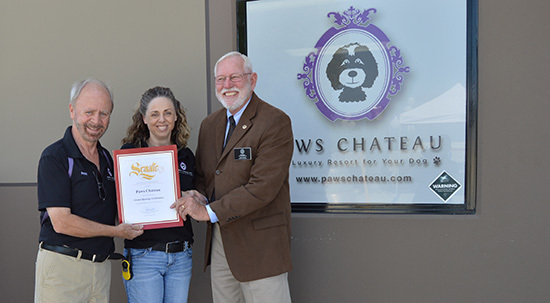 It a pleasure working for Paw Chateau because they gives you more experience and always learning more about different species of dogs and how to care for them. 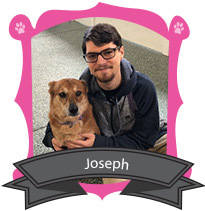 Hi, my name is Joseph and I have been a Day Camp Counselor at Paws Chateau since April 2017. I am responsible for taking care of the dogs and keeping them safe. I am currently enrolled as a student at Goldenwest Community College. I have grown up around dogs my whole life, so getting to work with them has been amazing. Being a college student, working with dogs brings an enormous amount of stress relief to everyday life. Many people don’t get to say they look forward to coming into work daily, but I am privileged enough to be able to. I have a German Short-haired Pointer mixed with Doberman named Boomer at home. Hello, my name is Heather Georges and I have been a Day Camp counselor since May 2017. I am currently working on general ED at Golden West College and am hoping to transfer to a university to one day work with animals professionally. I have been around dogs all of my life and I feel like I share a deep connection with animals. I am currently the proud parent of two dogs named Calvin (Poodle/Terrier mix) and Hobbes (Poodle/Shih Tzu mix) who are like brothers to one and other and seem to be joined at the hip. I joined Paws Chateau to get experience working with dogs while I narrow down what career I want to proceed with animals. I’m already canine and feline first aid and CPR certified and planning to get a certification in dog training. I hope when I move out on my own I will be working with animals whether its with dogs or at a zoo while I’m fostering dogs and cats at my home. 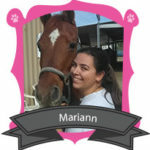 Hi, my name is Mariann and I have been a Day Camp Counselor at Paws Chateau since June 2017. I clean up the play area and make sure everyone is following and playing by the rules. I am studying comparative world literature at Cal State Long Beach and expected to graduate spring 2019. Growing up, I’ve always been around animals: dogs, cats, fish, and horses. With a passion for animals, the opportunity to work at a dog daycare sounded amazing and I have enjoyed every moment of it. At home, I have 2 dogs, 3 cats, and saltwater aquarium. I am an aspiring therapeutic riding instructor and plan on beginning the certification process summer 2018. My future plans include passing the certification, becoming a writer/poet, and having my own horse. My name is Linda. I have been a Day Camp Counselor at Paws Chateau since July 2017. These are my 4 baby’s: Roxy, Duke, Sammy and my puppy buddy. Three of them I rescued from the ASPCA and the puppy was a gift from my son. I have been an animal lover since I was a child I seem to understand them and they seem to understand me. I’m blessed to have a job working with dogs I truly enjoy it. 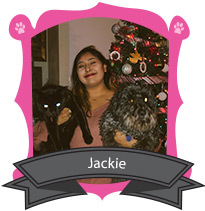 Hi, my name is Jackie. I have been a Day Camp Counselor at Paws Chateau since August 2017. Currently, I am enrolled at Cypress College where I am studying Kinesiology to become an Athletic Trainer. I have grown up with pets my entire life, and I own 3 dogs and 1 cat, Harley, Snowy, sassy and toothless. My dad got me my first pet when I was 7 years old and a few months later we rescued sassy and 3 years ago I found Harley on the streets and toothless was a gift from a friend. 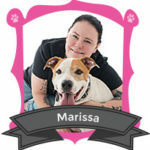 Although I am not pursuing a career with animals I have always had a deep love for them and have always wanted to work with animals, so it is a pleasure to be a Dog Counselor here at Paws Chateau. I started volunteering at adopt and shop when I was in high school and since then I had always loved working with them. Just being around dogs makes my day, dogs teach you how to be responsible and how to love and care for them. Dogs will always be there for you, they’re your best friends and we are there humans. Hi, my name is Mike and I have been a Day Camp Counselor at Paws Chateau since November 2017. I have been surrounded by animals my whole life ever since I was little. I’ve had and taken care of all kinds of animals from dogs and cats to different types of reptiles and amphibians. I am currently enrolled in school for video game design but my love for animals is strong and I’ve always wanted to work with animals, so this position is perfect for me while I’m in school. 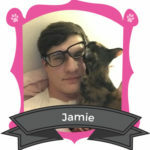 Hi, my name is Jamie. I have been a Day Camp Counselor at Paws Chateau since October 2018. I’m a farm-raised animal lover and amateur programmer from Illinois living the dream here in California. I love history, language, and genealogy, and I have four cat companions at home. I grew up with so many dogs that working for Paws feels like being at home again. Hi, my name is Jane. I have been a Day Camp Counselor at Paws Chateau since October 2018. I have a heart for animals and even human beings. I am currently working my way through the medical field and hoping to get a degree in radiology, music, and/or religious studies. I have a passion to helping make this world a better place: one smile at a time. I’ve always loved dogs growing up, they are fun spirited animals who need as much love as we do. I enjoy working at Paws Chateau and helping dogs come out of their shell. As a shy person, it’s helpful having someone by my side to get to know others. I try to help these little animals do the same with patience, love, and the proper discipline. Hi mt name is Cassidy. 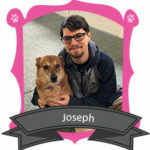 I have been a Day Camp Counselor at Paws Chateau since October 2018. I love food, my awesome cat Stitch and his awesome sidekick Xena a.k.a my three year old German Shepard. I love skating in my free time and hanging out with friends. I have always been around dogs since I could remember and have felt a special bond with every single one I have encountered. I also feel lucky to have worked with horses as well, connecting with such incredible animals allowed me to get rid of my fears and respect all animals gaining the confidence I need. With time I hope to return back to school and get certified in auto mechanics. Aside from animals I have a HUGE passion for cars and hope to one day own my own Auto shop. Who says a girl can’t fix cars? Error: Error validating access token: Session has expired on Monday, 25-Mar-19 15:37:59 PDT. The current time is Tuesday, 16-Apr-19 01:35:29 PDT.